An article appeared in the Chronicle of Philanthropy last week titled, “Nonprofit Leaders Add to Outpouring of Fury Over Border Policies.” It talks about how nonprofits like the Texas Civil Rights Project and Save the Children are responding to the Trump administration’s “zero-tolerance policy” that has resulted in separating parents seeking asylum at the southern border from their children. Amid the outrage that led up to Trump’s decision to reverse course and sign an executive order stopping the forced separation of families, money poured into nonprofits that deal with immigrant rights issues. The goal of the fundraiser was initially $1,500, enough to help an immigrant family post bond. At the time of this writing, more than 500,000 people have donated more than $20 million. In its first ten days, the fundraiser averaged over $1,400 a minute. The goal has been increased from the original $1,500 to $25 million. Facebook reports that it is the most successful Facebook fundraiser in history. The annual budget for RAICES is around $6 million; their entire annual fundraising goal is less than $1 million. 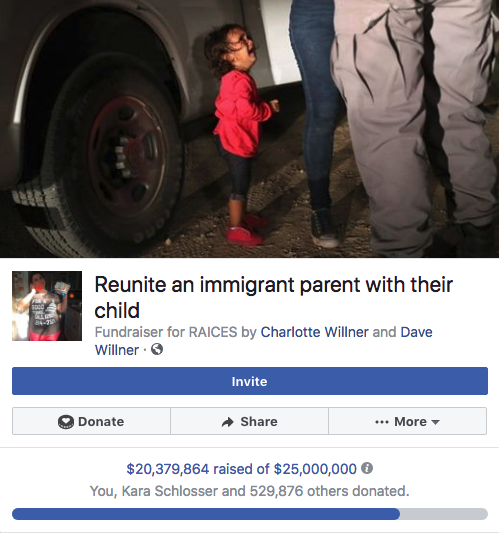 RAICES executives first learned of the fundraiser in an email from the Wilners that said that their fundraiser seemed to be “getting kind of large.” At that time, it had raised less than a million dollars. During the week they watched in astonishment as more than a million dollars a day came in through Facebook. The lightning-in-a-bottle success of the campaign has been compared to the ALS Ice Bucket Challenge. Although both were fueled by a viral response by donors, the campaigns have little else in common, besides the torrent of donations, of course. The success of the IBC was due to associating a cause (ALS) to a novel behavior – dumping water on one’s head. Very few people are directly affected by ALS, so the temperature of their emotion towards the mission of the ALS Association was tepid. Anecdotal evidence says that rage donation does provide a catharsis for political frustration. We know, because we donated to the Wilner’s fundraiser when it was at about $4 million, and yes, we did feel somewhat better! A bigger issue that rage donations bring into focus is the use of Facebook as the fundraising platform of choice. Here’s the good – it’s cheap, as in it’s free. There is no transaction fee charged for running the donations through the platform. Susan G. Komen recently announced that they raised more than $1.7 million via Facebook for their Race for the Cure series. Here’s the bad – although the money belongs to you, the data belongs to Facebook. When we talk to clients the first pain point they always bring up is acquisition. The names and contact information for the 500,000 plus donors, (including us) that contributed to the Wilner’s fundraiser were acquired, all right, not by RAICES but by Facebook. And Facebook will sell or license that information in the future to the highest bidder. Your options? You can use a platform like Blackbaud’s TeamRaiser that has an integration with Facebook. Donors aren’t redirected to a TeamRaiser page to donate; instead, they remain in Facebook’s interface to complete the shorts steps required to make a donation. And you don’t have to worry about getting the information back into your CRM. Dollars raised from Facebook are automatically reflected within the TeamRaiser campaigns and reporting. But that doesn’t solve the acquisition problem. Turnkey has engaged with a partner who has developed a clever way to interact with donors via Facebook Messenger. When contacted through Messenger via automated messaging, 20% of organic donors are responsive. Of this group, 80% opt-in and give up their emails. Finally, Charity Dynamics has an application called Boundless Fundraising that accomplishes data acquisition. While there’s an investment involved in implementing this kind of technology, we all know the value of acquisition. What you hope to do is break even in the short run in order to enjoy handsome dividends over time. And, you know how valuable that information is? So valuable that Facebook built a free platform just to get it.